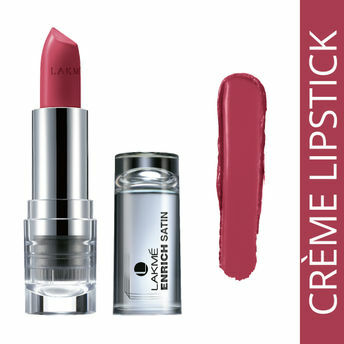 Bought to you from the Lakme Classics range, India's leading lipstick range - The Lakme Enrich Satin Lip Color keeps your lips satin soft, vibrant and lasts long. With various new shades added to the existing and exciting trendy range of colors, it now makes brilliant shades to suit all skin tones. One of Lakme's most popular and mainstay classic lipstick range, Lakme Enrich Satin lipsticks are back in a whole new avatar. Designed to match every Indian skin tone our Lakme Enrich Satin Lipsticks continue to keep your lips moisturized & satin soft, with vibrant & long-lasting Color. One coat and your are set to go! So pick Lakme Enrich Satins lip color in your favourite shade, Now! Available in a variety of shades suitable for the Indian skin tone. Range of 70 trendy shades . Explore the entire range of Lipstick available on Nykaa. Shop more Lakme products here.You can browse through the complete world of Lakme Lipstick .